I dig sharp things - usually buy Spyderco - but the Kershaw Leek has caught my eye. I've drooled over them all over the Internet ... never handled one in real life. I'd like to hear from those who have owned or do own this model - pros & cons please! I have a couple and find them very useful and easy to carry. I do not like the safety, but it is easily removed. Had an issue with the pocket clip bending, great customer service. They are the right size for me, for daily carry. They take and hold a good edge. Great value for the money. Nice knife, mine came very sharp. The lock, as mentioned takes a little bit to get used to, or remove it. The tip is very pointy, so no prying with it! I lost my Leek with G10 and S30V blade. I still have not found it! Damn, they don't make it anymore. I had to fall back to a plain Leek. Good but not as nice as the lost Leek. Bought one at the Finn Feather and Fur last week, On sale for 32.00 till December 2017. Great EDC knife as it is light and very sharp. The Leek is a great knife. 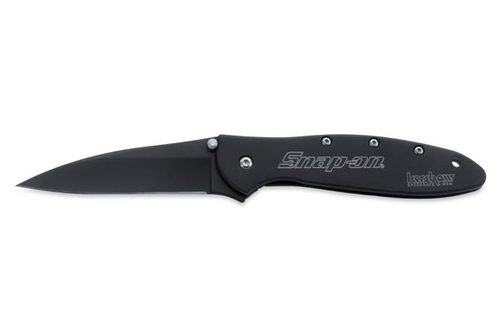 Very thin in your pocket and work well for EDC if you like a thiner profile blade. Kershaw as a company is great to deal with. I have a dozen or so of their knives and every once in awhile I send them in for factory sharpening and a check out. Recently I sent them 6 knives and they replaced 4 under warranty for not having a tight lock up. The 5th knife they replaced the blade free of charge for reasons unknown. These knives were all over 5 years old and were used hard. Very nice knives for the money. I had a Leek for a little while. It was my first assisted-opening knife. I didn't care for the assisted-opening feature, it always made me feel a little uneasy with it in my pocket unless the safety was on, and I didn't care for the safety. I ended up selling it and sticking with my Delicas. But lots of people like them. If you can't handle one, you may just have to buy one and see for yourself. Worst case scenario, you sell it and maybe lose a few dollars in the process if you don't like it. Thanks for all the input - greatly appreciated! I usually get my knives with blades that are half plain and half serrated. I've read that the Leek serrations are unlike any other, making them difficult to sharpen. How are they sharpened? I followed the link you posted and ordered two of that knife. Thanks for the link & savings! I have carried a leek in my pocket every day for over 7 years. I prefer the frame lock over the liner lock models but ymmv. In my experience the liner locks will grit up in the pocket much faster than the frame locks. I lost my favorite leek for almost a year. Happy day when I opened a pocket on some winter work coveralls and found it again. I've used my leeks to open boxes, cut sausage, cut a steak dinner, and gut a deer. The only thing they aren't good for is any prying pressure at the tip, it's just to thin for that. I've got a work knife that I reprofiled the blade just a bit. My favorite is the KER1660CKTSO. I carry a Leek with serrated edge for EDC. I love it. I have been through 3 of them, as I have lost the previous two. Only issue I have had has been with my current one: the liner lock broke a few times, and I had to send it in for repair. Happened three times, no idea why. My other Leeks didn't have any issues. I’m not sure that lock serves a real purpose. Of all my knives from assisted to auto I’ve never had one come open in my pocket. Just get a torx set and and ask Kershaw to send you the part next time it does. I’ve had 2 torsion bars break in different Kershaws and both times I emailed them asking for a new bar and the next question has always been “what your mailing address?”. I've had the knife open in my pocket once on its own. I carry clipped to the pocket, blade tip up. Trust me, you don't want it to happen. My luck was when I was starting to kneel down. Luckily it was only a small poke, but it is in an area that makes you respect the safety. I love mine. It is my "city carry" when I'm not carrying my Blur. Great little “discreet” knife. I have mine with me when I don’t carry my Esee 3 or Endura Wave. The Leek is a little small for my tastes. You might want to look into the Kershaw Dividend, Link or Knockout. All American made. If you want to spend a little bit more, the ZT0450 is a amazing little lightweight knife. I like them, just don't try prying anything with that thin blade. You'll see a lot of used leaks with the tip broken off or bent.